With the onset of the start of the annual dolphin hunting season on September 1, the time is propitious to take a hard look at what takes place at the notorious fishing town of Taiji, Japan. Whalers, equipped with nets, harpoons and butchering knives, set out to sea in a drive hunt for dolphins. Once a pod is spotted, the hunters surround the dolphins with their boats and clang on metal poles to create a wall of sound that panics these acoustically sensitive animals. The dolphins are then driven toward shore where they are pinned against the coastline with nets. Once entrapped, they are kept at bay for inspection by aquatic park agents, who reportedly pay thousands of dollars each for so-called "show" dolphins. 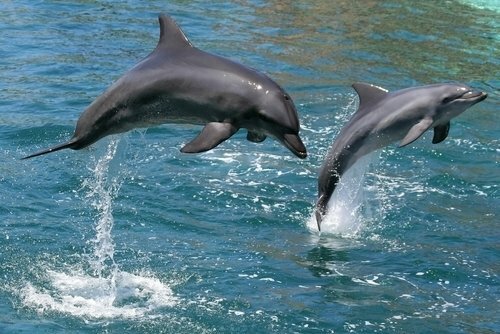 Dolphins sold to marine parks will never again be free to swim and socialize with their pod. Instead, they are doomed to a life in captivity in concrete tanks where they must perform "tricks" to entertain audiences. The trademark smile and the playful nature of dolphins - - considered to be one of the most intelligent animals on the planet - - belie the predicament that they must endure in confinement. Dolphins not purchased by dolphinariums are brutally slaughtered by stabbing them with spikes, usually just behind the blowhole, causing the animals a slow, spasmodic death. The maimed and dyeing dolphins thrash about and writhe as they try to escape, but there is no exit from the bloodbath. This is the price they pay so the fisheries can squeeze some extra profits from the victims of their prey by the sale of dolphin meat. The carnage off the coast of Japan had been a dark secret until 2009, when the Academy Award winning documentary The Cove exposed the horrifying truths behind the hunting of dolphins. According to The Japan Times, the Japanese government allows about 19,000 dolphins to be killed each year off the coast of Japan. Despite the magnitude of the killing, and its gruesome nature, the International Whaling Commission (IWC) has failed to take any action because dolphins are not a protected cetacean. Given inaction by the IWC, the time is long past due for our government to take forceful action to bring the dreadful practice of dolphin hunting to a halt. Currently, the Office of the United States Trade Representative, under the auspices of President Obama, is negotiating the Trans-Pacific Partnership (TPP) agreement with 11 other nations, including Japan. TPP presents a golden opportunity to apply strong pressure on Japan to ban the capture and slaughter of dolphins. In the final analysis, Congress, which has the exclusive constitutional authority to regulate commerce with foreign nations, will set the terms of the deal. Pursuant to its power, Congress can impose targeted trade sanctions to effectuate policy objectives. Trade policy is a powerful tool to address the hunting of dolphins by a nation that is heavily dependent on trade relations with us. With the public's growing alarm about hunting dolphins, it is imperative that Congress flex its muscles to end this most egregious practice when it is called upon to exercise its authority vis-à-vis TPP. Until such time as governmental action may be implemented, spurning facilities that feature dolphins as performers would send a loud and clear message to industry operatives to stop the live trade in these wondrous creatures. Current sourcing methods can be replaced with a protocol whereby dolphins are obtained solely from certifiable organizations whose mission is rescue, rehabilitation and release. Such a paradigm would afford sick or injured dolphins sanctuary, while not holding captive those capable of surviving at sea. Reformation of the existing business model, from one of entertainment to one where the beauty and grace of these remarkable beings can simply be observed in a natural environment (such as sea pens), can be a win-win for both dolphins and people that appreciate their true nature. Only then, can captive dolphins have a chance to experience their birthright to be wild and free at sea where they belong. This new paradigm offers hope of making the dual stains on our legacy of dolphin captivity and dolphin slaughter a forgettable memory. Ric O'Barry, Director of Earth Island Institute's Dolphin Project, who first gained recognition for training dolphins in the TV series Flipper, has since dedicated himself to combating dolphin captivity. Ira Fischer devotes his retirement from the practice of law to animal welfare through advocacy.